In preparation for the GLVC Championship tournament, Head Tennis Coach Malik Tabet said his teams were focused on mental toughness and getting their mindset ready for the matches. “Right now, there really isn’t much improvement that is made, but the mental part of it. We are talking a lot about mental toughness, trying to get the teams to stand at having to be mentally tough, mentally stable and mentally right on the edge to play. There is no room for error when you are playing in this tournament. 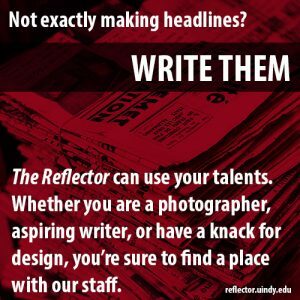 One loss, and you’re done,” Tabet said. “So they understand that, and that’s what we’ve been focusing on a lot for the last couple of weeks. Both the men’s and women’s teams took home the conference title a goal Tabet said he wanted to achieve. The men swept the competition, beating all teams 5-0. 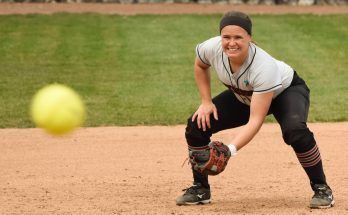 First, the Hounds took on Quincy University on April 22 in the quarterfinals, sending Quincy home for the season for the third season in a row. Senior Arklon Huertas del Pino contributed wins in both singles and doubles play, after capturing the GLVC Player of the Year Award. Junior Nils Hoffacker sealed the victory for the Hounds with a 6-0, 6-0 win over his singles opponent, allowing UIndy to advance to the semifinals. 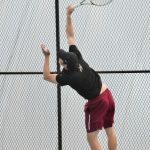 The Hounds continued their quest for the conference title against Rockhurst University on April 23. Pino and doubles partner junior Andrea Morlet defeated their No. 1, regionally-ranked opponents 8-4. 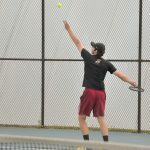 Doubles pairs junior Christoph Drechsler and sophomore Magnus Mueller and doubles pair senior Marco Razo and Hoffacker also took home wins in their matches, giving UIndy the advantage going into the singles competition. Needing only two singles wins, Mueller and Razo each defeated their opponents and earned the Hounds the win. 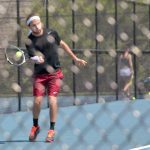 In the final matchup of the championship, the men took on 17th ranked Drury University on April 24. 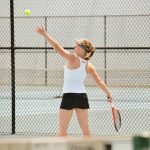 The Hounds again gave themselves the advantage during the doubles competition, when they swept each of their Panther opponents. Pino and Mueller both won singles with scores of 6-0 and 6-1, sending the Hounds to a conference title for the second year in a row. The women’s team also clinched a conference victory over the weekend. 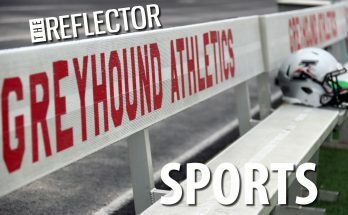 The Hounds kicked off their quest for the title, sweeping Maryville University on April 21. 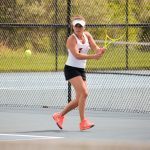 After the initial sweep from all three doubles teams, GLVC Player of the Year junior Hanna Volikova dominated in singles, while also setting the program’s record for the most wins in a single season with 26. Junior Florence Renard also defeated her singles opponent 6-1 and 6-2, sending Maryville home. 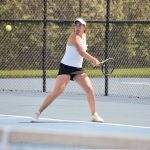 The Hounds advanced to the semifinals against Lewis University on April 23. Freshman Bella Bergman and junior Mara Hofstetter were the first and only wins in doubles play, with a score of 8-4. Despite being down in doubles, the team made up for it in singles play, winning all six matchups. In the final competition, the Hounds defeated Drury University 5-4 on April 24. Volikova and Renard were the lone winners in the doubles competition and notched a victory in singles play. Seniors Stephanie Hirsch and Selenay Heper also added to the singles wins notching the Greyhounds their 10th conference victory. According to Tabet the mutual advantage the men’s and women’s teams share is the experience of playing on the courts. Going into the GLVC Championship Tournament the men’s team was ranked 13th, a record-breaking ranking for the team. “We’ve never been ranked this high before, so we’re making history,” Drechsler said. According to Dreschler, the University of Southern Indiana played against UIndy in the conference last year but was not an easy opponent. Although the teams are preparing for the end of their season together, there is one weakness that all of them face during the end, according to Renard. “Our biggest weakness as a team is staying focused. It’s hard to play three matches in a row and staying focused on all three of them. It’s a challenge for me and the rest of the team,” Renard said. The team will both be moving on to participate in the NCAA Regional Championship. The women earned a by, and will play in the Regional Final on May 2, and the men will play the University of Southern Indiana on April 29, both hosted at Center Grove High School.